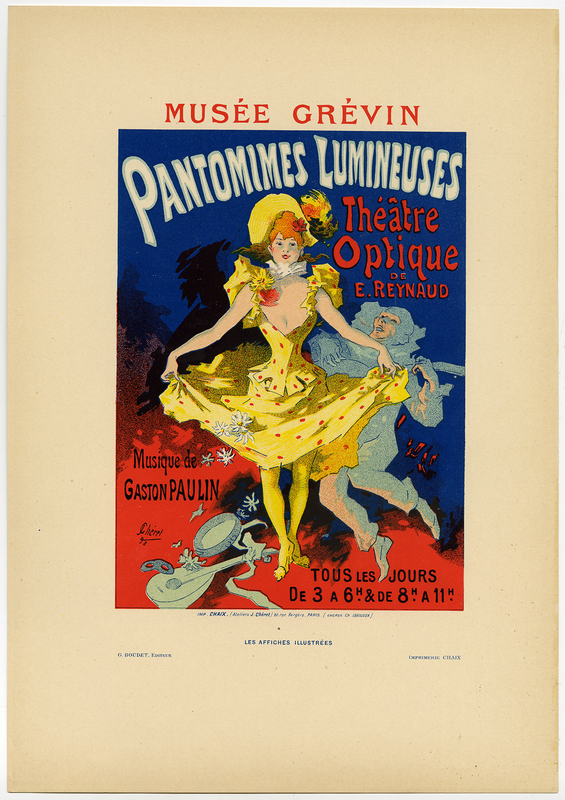 Subject: Antique print, titled: 'Pantomimes lumineuses.' - Poster advertising for a theatre show. Condition: Very good, given age. Ample margins. General age-related toning and/or occasional minor defects from handling. Please study scan carefully. Medium: Colour lithograph on wove paper. Size (in cm): The overall size is ca. 22 x 31.7 cm. The image size is ca. 22 x 31.7 cm. Size (in inch): The overall size is ca. 8.7 x 12.5 inch. The image size is ca. 8.7 x 12.5 inch. Description: Published in "Les affiches Illustrees" by Ernest Maindron, published in 1896. Artists and Engravers: Made by 'Jules Cheret' after own design. Jules Cheret (1836-1932) specialised in posters. He was called the "Master of posters".